Wasfi Taher bought the Optima successfully nurtured it for 10 years before its first appearance at Baselworld 2003. This was a significant step, as the brand had been virtually forgotten before Taher took over. An emphasis on elegance and the most strictly enforced high-quality manufacture at the brand’s Le Locle workshop has brought it, brilliantly, into the light. Optima has been truly reinvigorated since 2003, Taher – who had already established watchmaking company Riba Watch and launched Murex – was ready to expand his business and found himself drawn by Optima’s heritage and tradition. His chosen strategy was to conserve the elegance of the brand while bringing it up to date with new and original designs. Today, Optima, like sister brand Murex, has two collections for men and women – one fashion-led and the other offering diamond pieces. But while Murex designs have a distinctly modern outlook, Optima are a gentler brand that places an emphasis on unique designs. 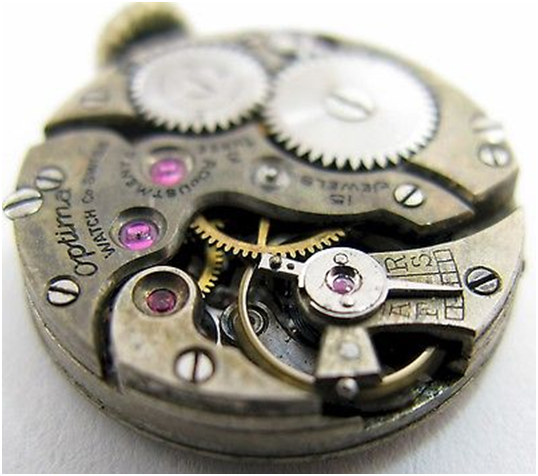 THE BEAUTY OF Optima watches lies in their detail. A glance at any one of the brand’s pieces reveals that its construction has been carefully thought about, whether that be a combination of different materials – a stainless steel case and a gold-plated bezel, or a contrast in matt and shiny textures – or perhaps its patterns or a variation on the index. From metals and mother-of-pearl through to precious stones, Optima combine different materials in layers to create an understated relief effect on the watch dial. This approach, incorporating several different components to create an effect, makes the watches stand out. Another thing that unites Optima watches is elegance. For a watch to attain the level of elegance the brand demands it must first be of a size that will enhance the wrist – for men, this means watch cases range from 42mm to 45mm and for ladies, from 34mm to 40mm. The OSC299M best represents Optima’s ethos, with its two-layer dial, a touch of mother of pearl, roman index and perfectly married crown and bezel. Every year, 50 per cent of the collection is updated, launching around 20 new models. It is part of the brand’s philosophy to offer a wide range of designs and price points to customers, so that collections are accessible to as many people as possible.